Local Projects worked with the Tech Museum of Innovation in San Jose, CA to develop the BioDesign Studio which opened on March 18, 2016. The goal of the BioDesign Studio was to design interactive exhibits to demystify one of the least-understood and most controversial topics in modern science: synthetic biology. The client outlined the basic flow of the gallery, splitting exhibits into two groups. The first group familiarized visitors with the fundamentals of biology, and the second group of exhibits builds on these foundations to introduce visitors to more complex concepts from synthetic biology. The Tech Museum serves a diverse audience. The exhibits were designed to be educational, rich, and engaging for children, teenagers, and adults. The Tech Museum is also a popular destination for school field trips, thus had to be designed as teaching tool for large groups of students. Local Projects designed four core exhibits for the gallery. Two foundational exhibits include Exponential Self, in which visitors replicate themselves from a single cell into thousands through a gesture-based interface, and Pattern Design, which lets visitors take control of the rules behind nature’s emergent systems to design new coat patterns on life-size animal sculptures. These lead into two “deep dive” exhibits, the Creature Creation Station and Living Colors Lab. 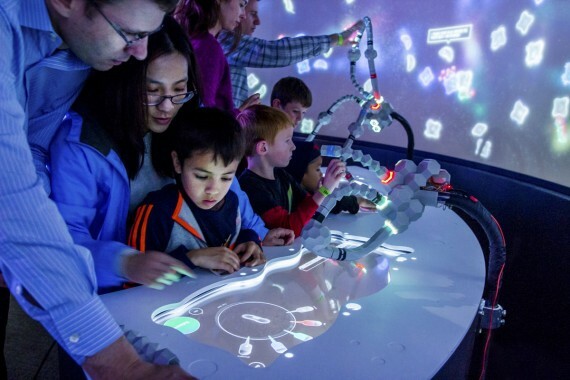 The Creature Creation Station blends customized physical and digital interfaces to put life’s building blocks in visitors’ hands. Visitors design virtual lifeforms by snapping together physicalized pieces of DNA. Sensors in the magnetic DNA “blocks” synchronize with a virtual petri dish showing the creature transforming in real-time as its genome changes. Once satisfied with their design, visitors launch their creature into the 30-foot-wide “Bio Pool”, where it swims and interacts with other visitors’ creatures according to the rules encoded in its DNA. Visitors are encouraged to observe, revise, and repeat the design process to understand the relationship between genetics and behavior. In the Living Colors Lab, projection mapping creates an “augmented lab bench” that guides visitors step-by-step through a real-world experiment mixing DNA into cells to create colorful glowing bacterial colonies. A wall behind the workbench with 1,493 glowing LED petri dishes visualizes results from the experiment in real time and highlights newly discovered colors. The BioDesign Studio represents several innovations in hybrid physical / digital interaction approaches. The Living Colors Lab’s augmented-reality workbench opens up an otherwise complex biology experiment to wider (and younger) audiences by projection-mapping the exact step-by-step procedure on top of the actual tools and materials. In the Creature Creation Station, the tangible DNA building blocks represent how close collaboration between user-experience designers, software developers, and hardware engineers can yield one-of-a-kind visitor experiences that blur the lines between physical and digital. The result leverages the affordances of a museum environment to create collaborative multi-sensory experiences that can’t be replicated on a phone or in a web browser.